DON'T MISS OUT ON THIS AMAZING WORK OF ART!!! Sterling Silver, Turquoise, Picture Rock, Red Oyster Shell, White and Yellow Mother of Pearl, Black Jade, and Opal. The inner bracelet circumference measures approximately 5", plus a 1-1/8" opening, and 3/4" at widest point. This captivating bracelet is a work of art and has everything you could possibly want from a piece of jewelry! This piece of jewelry is hand crafted out of genuine sterling silver and Multicolor inlay. The inlay consists of: real Turquoise, Picture Rock, Red Oyster Shell, White and Yellow Mother of Pearl, Black Jade, and man made Opal. This piece features outstanding detailed inlay work that forms a wonderful Native American Design. In this scene, Mountains can be seen surrounded by a night sky filled with Planets and a variety of stars! This bracelet also features Black Jade inlay that is set on the inside of the cuff for added style. 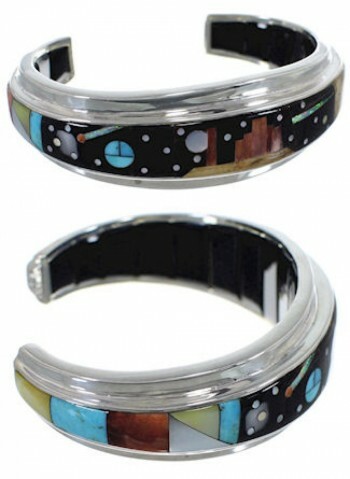 The inlay is gently set in a silver cuff for a marvelous finish.